Most people ignore the real cost of car ownership. Therefore, is the “EV’s are too expensive” dismissal based on a vague understanding of the real car ownership cost? Now that we’ve refreshed our memory on car ownership costs, we can honestly compare the ownership cost of gasoline versus electric cars. We’ll see that EV’s give significant the cost savings over gas powered vehicles. Earlier we saw the EV Price Premium was about $15,000 at the “affordable” end of the electric car spectrum. That’s our first target, to identify $15,000 in savings, and the next target is to identify enough savings to completely pay for the car. We can’t get away from spending money to own the car. What we’ll do instead is show enough in total cost of ownership savings, compared to an equivalent gasoline car, to at least pay for the purchase price. 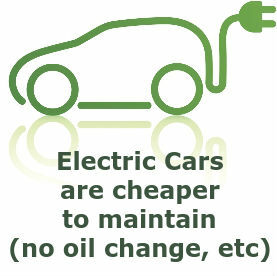 The key is fuel cost savings – because electricity is a far cheaper fuel than gasoline. Based purely on fuel cost savings this class of people (taxi drivers in China), whose daily vehicle miles traveled are way above what most of us do, could theoretically have enough cost savings to pay for their car within two years. For a more practical example most of us can relate to, let&apos;s see how the purchase of a 2015 Nissan Leaf works out. The Chinese taxi example shows us fuel cost savings can pay for a car several times over. The same concept works in America because it&apos;s based on the difference between gasoline and electricity costs. We calculate this by the cost to travel N miles on either fuel.The EPA makes fuel cost estimates based on 15,000 miles a year driving. At $3.70 per gallon, a relatively fuel efficient car like the Ford Focus costs $1,350 for fuel, while an F150 will cost $2,100 for fuel. By contrast the EPA fuel cost estimate battery EV&apos;s, on 15,000 miles a year driving, is between $500-600 a year.Our $700 number is the difference in EPA-estimated fuel costs between a gasoline Ford Focus, and the Ford Focus Electric.The more you drive the more that can be saved, as the Chinese taxi driver demonstrates. $700 or more a year, or $3,500 or more for five years. I found it difficult to find clear estimates on this. There&apos;s no oil to change, no spark plugs to replace, and electric motors are extremely reliable. That implies maintenance and repair will be very low, but neither the edmunds.com nor the kbb.com ownership cost estimates show a significant savings in this area. About $500 over five years, according to edmunds.com and kbb.com. Add this up ($7500 + $2500 + $3500 + $500) and we have about $14,000 in savings over five years, in California, most of which is the federal tax credit. That&apos;s enough to reduce the effective cost of the Leaf SV to about $18,000. Looking at the Nissan Versa Note -- the closest comparison to the Leaf -- it&apos;s the Versa Note SL trim level that most closely matches the Leaf SV. That car has a base $18,660 MSRP. Without trying too hard, the tax credits, California state rebate, and fuel cost savings, are enough to make up for the EV Price Premium between a 2015 Leaf SV and Versa Note SL. But, wait, we&apos;re just getting started. While not all states have tax credits or rebates on top of the Federal tax credit, some do, and in some cases they&apos;re even more generous than California&apos;s rebate. 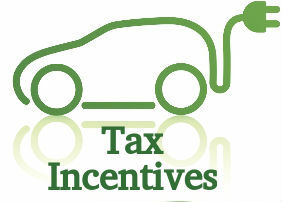 You may be lucky enough that your state is more generous with the incentives. However, we shouldn&apos;t be dependent on the tax credits. Depending on the political winds over the next couple years, the government incentives may either expire or be repealed. The fuel cost saving is the key to grabbing enough savings to pay for the car, as our Chinese taxi driver example shows. The fuel cost savings we show is calculated from the EPA estimated fuel cost of the electric and gasoline versions of the Ford Focus. The EPA&apos;s calculation is based on 15,000 miles a year driving, and $3.70 per gallon for gasoline. Both of those are national averages, what&apos;s important to calculate is YOUR circumstances. 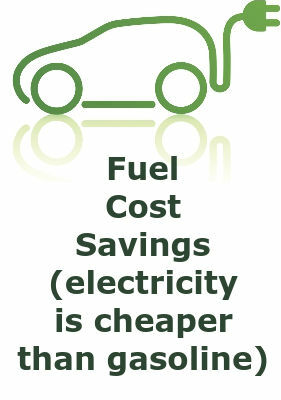 Fuel cost savings are calculated by subtracting electricity cost from gasoline cost. What we&apos;re looking for is to widen that gap to save the most money possible. Gasoline MPG -- At $3.70 per gallon, a 36 MPG car costs $0.10 per mile for gasoline, but a 20 MPG Ford F150 costs $0.19 per mile. The F150&apos;s EPA estimated yearly fuel costs (15,000 miles, etc) is $2,100. Switching from an F150 to a Nissan Leaf saves you $1,500 per year in fuel costs, or more than twice the average shown above. Over five years that&apos;s $7,500 total in fuel cost savings, and ($7500 + $2500 + $7500 + $500) the total savings is over $18,000. While we got our goal, enough fuel cost savings to pay for the car, it&apos;s not practical to drive a Leaf that many miles in five years. If nothing else, doing so would certainly cause at least one battery pack replacement. But, wait, if your comparison vehicle is a gas guzzler you&apos;d be saving more per mile. You get the idea, the more you&apos;re currently spending on fuel the more you&apos;d save by switching to electric. Cheap electricity - time of use metering - solar panels -- Another way to increase the fuel cost savings is if your electricity is cheaper than average. The EPA electric car fuel cost estimate is based on the national average of 12.35 cents per kiloWatt-hour. There are two widely available methods to decrease electricity costs. Time of Use Metering Night-time electricity rates are really low because of excess electricity on the grid. In some areas customers are charged a variable rate for electricity based on the time of day it&apos;s consumed. Daytime electricity is in greater demand, and is therefore more costly. One effect is to incentivize electric car owners to charge at night, and to soak up that excess electricity that otherwise will have gone to waste. Solar panels Adding solar panels to your home either reduces or even eliminates your entire electricity bill. Once your solar panels are paid off, the electricity they produce is essentially free. At $3.70/gallon (current gasoline cost in California), a 36 MPG car costs $0.10 per mile for gasoline. A battery electric car at 12 cents per kiloWatt-hour costs between $0.03-$0.05 per mile for electricity. Comparing a very efficient gasoline car to an electric, and you&apos;re saving 6 cents a mile on fuel costs. 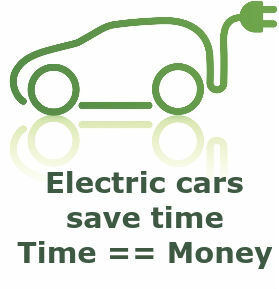 Electric cars can save time for their drivers and, under the theory that time is money, time savings have an economic value. By not having to detour to and visit gasoline stations to refuel an electric car, it’s estimated you save 10 minutes a week, which might be worth $33 per month. By being able to use the HOV lane as a solo driver (as some states allow), it’s estimated you’ll save 10 minutes a day on your commute time, which might be worth $167 a month. If you can reap both benefits, it’s $2,400 a year, or over five years of ownership it’s $12,000 in savings from time you don’t have to spend. What you’ve actually saved is your time, and the question is what’s your time worth. You won’t necessarily end up with more dollars in your pocket because of saving time, but you will have spent less time on those things. Electricity prices are more stable than gasoline prices, insulating electric vehicle owners from wildly swinging gasoline prices. As I write this, it’s February 2015 and OPEC is conducting a global crude oil price war that’s driven gasoline costs down to levels not seen in a decade. However, what the last 10 years (or more) have taught us is that global instability is causing gasoline prices to swing wildly, putting anyone dependent on fossil fuels at risk of price spikes. Further, it’s true that the long term gasoline price trend is upward, because of inexoribly declining crude oil supplies. While there will be short term price manipulation from time to time, the trend is up. Because electric cars are quiet and don’t shake and rattle (no explosions in the engine), the ride in an electric car is serene. Noise pollution makes our cities unpleasant to be in, cause irritation and anger, causes cardiovascular problems and more. Public health officials around the world are concerned about the plague of noise pollution, and some countries are enacting regulations to require quieter vehicles. The ride inside a gasoline car and electric car couldn’t be more different, thanks to the noise and vibration of gasoline engines. 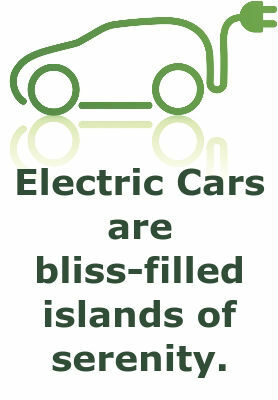 By contrast electric cars are islands of serenity. In our time jammed hyper tense modern society, how much is serene quiet time worth? See Driving an electric cars is serenity, what’s “peace of mind” worth to you? Two major threats loom in our future that could cause global society-wide turmoil and negative consequences. Climate change threatens food supplies, water supplies, and more around the world. Peak oil threatens the ability of our whole society to do anything as crude oil supplies dwindle. It’s thought both will cause massive economic and political instability. 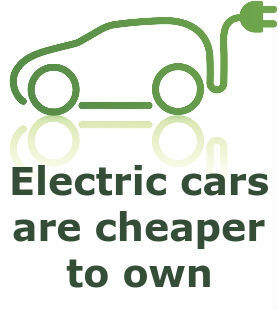 Is the slightly higher cost of an electric car a worthy investment to stave off that future? See What is it worth to avoid future climate change and environmental catastrophes? It’s been observed in the past that when gasoline prices go up the owners of gasoline vehicles look for alternatives. In 2007-8 there were Texans looking to ditch their F-150’s because fuel cost had risen so high, for example. Car buying for most people is obviously based on many other factors than just operational cost. For some it’s color, for others it’s a functional need like the ability to carry a load of horse riding gear. 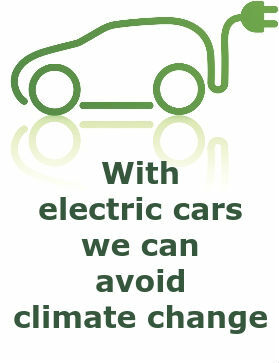 Some of us look at environmental factors, then buy a hybrid or electric car. But whatever the reasoning we have for choosing one car or another, the economic viability of electric cars means getting to cost parity (or better) against gasoline powered cars. It seems typical car owners don’t understand the real total ownership costs. A big gap is the number of people considering the cost to drive, unless there’s a gasoline price hike like what happened in 2007-8. Because most people don’t think about the cost to drive - they just drive - they might drive to a store 30 miles away to save $5 at a great sale, but spending two gallons of gasoline (about $7) in the process. That’s a symptom of ignoring fuel cost. Electric cars gift their owners with other values that aren’t captured in these kind of operational cost figures. EV’s give access to new values, access to new benefits, and have new behaviors. Values like a different more fun driving experience. Or the environmental/social/civic goodness that comes from driving an EV. Never going to the gas station again. Never sending your money to OPEC again. Never spewing nasty emissions into the air again. Never again to be chained to some corporation for the freedom of mobility. But - EV’s do eventually need to produce a positive economic benefit for them to hit the mainstream. The long term trends indicate that will happen in a few years. Gasoline prices will continue inching upwards every year, while battery prices will continue inching downward. This means the operational cost savings will be steeper (because of high gasoline prices) and the price premium will be smaller, shortening the payback period.